If we’re struggling for inspiration in the kitchen, we find looking back at the kitsch foods of the past can get us thinking. Prawn cocktail, profiteroles, toad in the hole, upside-down-pineapple cake; we wonder how much nostalgia plays a part in making these dishes so delicious? In keeping with our retro issue this week, we’re serving some amazing devilled eggs and homemade fish fingers stuffed in a roll. Do not be afraid. 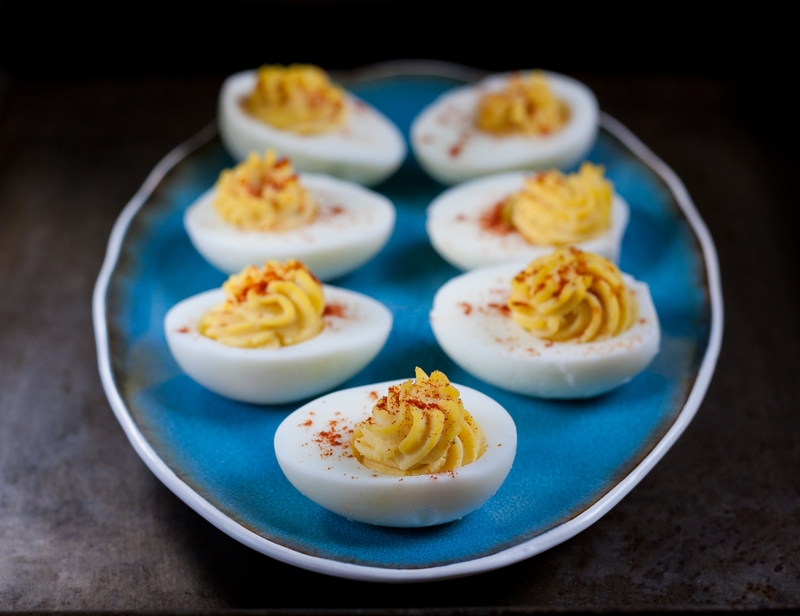 These are not like the sad, greyish devilled eggs that used to lurk at the back of your Aunt Linda’s buffet table during a family Christmas party. These are fresh and fun. Hard-boil the eggs by placing in a large saucepan of cold water. Bring the water to a hefty boil and then turn off the heat, letting the saucepan sit on the hob for 10 minutes. Drain the boiled water and run the eggs under a cold tap to stop further cooking. Slice the eggs in two from top to bottom. Using your fingers or a small spoon, scoop out the yolk into a bowl being careful not to damage the egg whites. Add the mayo, mustard, garlic and a good pinch of salt and pepper to the egg yolks. Mix really well with a fork until the yolks are fluffy and light. Give it a taste to see if you need more salt or pepper. Place the egg yolks mixture into a piping bag (you can also place it in a very clean plastic bag with a small hole snipped out of the corner) and pipe the yolks back into the egg whites. Finish with a sprinkling of smoked paprika and serve within a few hours, keeping in the fridge until you’re ready to go. This grown up version of a fish finger sandwich is a serious treat that combines crispy, baked fish with bright green pea-filled mayonnaise. Pre-heat the oven to 190c/170c fan/Gas Mark 5. Carefully slice the fish into wide rectangles. Don’t be tempted to slice too thinly as these fish fingers need a bit of width to keep their shape. Arrange the plain flour in a bowl and season with salt and pepper. Crack the egg into a bowl and beat with a fork. Add the breadcrumbs to a third bowl. Dip the fish into the flour, then the egg and finally the breadcrumbs. Lay on a lightly oiled baking sheet. Bake the fish for 15 to 20 minutes, until the breadcrumbs are golden and the fish is cooked through. Meanwhile, make your pea mayonnaise by blitzing the defrosted peas in your food processor (or using a pestle and mortar to give them a good bash). Add the mayonnaise, garlic, squeeze of lemon juice and a good pinch of salt and pepper and mix well. Check the seasoning of your pea mayonnaise before slathering it onto your soft rolls. Pile the fish fingers on top of your pea mayonnaise-filled rolls and serve with a slice of lemon.